While marketing does not lack measures, it lacks standard marketing metrics explicitly linked to financial performance in predictable ways. 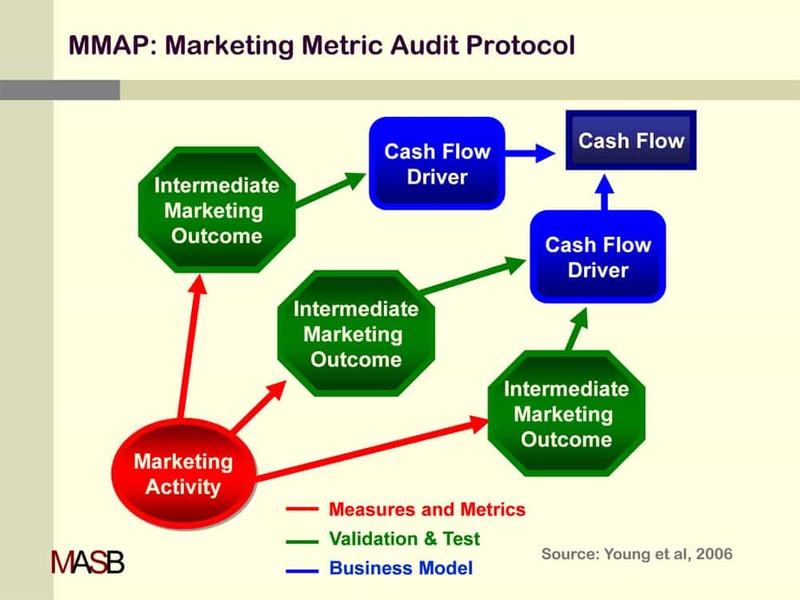 The Marketing Metric Audit Protocol (MMAP) is a formal process for connecting marketing activities to the financial performance of the firm. Cash flow both short-term and over time is the ultimate marketing metric to which all activities of a business enterprise, including marketing, should be causally linked through the validation of intermediate marketing measures. The process of validating the intermediate outcome measures against short-term and/or long-term cash flow drivers is necessary to facilitate forecasting and improvement in return. The process includes the conceptual linking of marketing activities to intermediate marketing outcome metrics to cash flow drivers of the business, as well as the validation and causality characteristics of an ideal metric. There will be at least one source of cash and one business model. In many businesses there is a dominant source and a dominant model. Distinguish between measures of efficiency, like CPM and cost per lead, and measures of effectiveness, like redemption rate for coupons and market share. Focus first on measures of effectiveness. Every marketing action should have identified outcome marketing metrics. If there is no logical link between a marketing outcome and a cash flow driver, you might question the need for the associated marketing activity. When there is uncertainty about the causal link between a marketing outcome and one or more cash flow drivers, validation or test is appropriate—especially if the costs of the marketing activity are high (validity and causality audit). Read more: Marketing Metric Audit Protocol and Measuring TV According to MMAP – An Example.